I was born in New York state and reared-up in the Ozark Highlands of Missouri. My father was the “Norman Rockwell” country doctor, my mother, a devoted housewife and mom. When I was five my loving sister, Salle Anne, came into our lives. We lived in the neat little farm-to-market village of Russellville, population: 336. I have fond memories of our modest home. We were the quintessential “Ozzie and Harriet” family, typical of that place and time. I remember the seemingly endless barefoot summers…and of that era, the swimming hole, the old steam engines chugging through, hand-crank phones, party lines, and a cornucopia of fresh vegetables and produce from the gardens and farms about. For entertainment, who could forget the Green Hornet, Sky King, Bobby Benson of the B bar B Riders, and the Shadow Knows on the old Philco radio? And on the come-and-go, snowstorm black and white TV, we tried watching Hallmark Hall of Fame, Groucho and the Ed Sullivan Show. There were five of us in my confirmation class at the Trinity Evangelical Lutheran Church. I sang in the choir just to have a front-row seat, there to marvel each Sunday as the rays of the morning sun shone through the stained glass windows, splashing a heavenly rainbow of light across the altar. There were only sixteen in my high school class. I lettered in basketball and track, also in baseball as a southpaw pitcher. The tenor sax was almost bigger than me when I began playing in the school band. Wheels were already the thing back then, and fast wheels were really the thing. I recall refitting my ‘53 Ford ragtop with a ‘55 Merc drivetrain. It was the hottest car around, nothing short of pure terror on wheels, with chopped top, dual Laker straight pipes, custom body, the works. Going fast on two wheels was also fun. After a number of summers, I managed to make and save enough money working local odd jobs to buy my first motorcycle, a worn out ‘47 Harley Davidson. It was great fun when I could get it to run. During those days, you’d find me decked out in Roebucks, a black leather jacket, the famous old Harley “conductor” hat…and for sport: sideburns, mustache and a D.A. Doo. Bet you don’t know what that is! I’m an armed forces veteran, and with much help and encouragement from wife, Sharon, I managed a doctor’s degree. We were blessed with two wonderful sons that would do any father proud: Jay, age 39, wife, Theresa, a darling granddaughter, Jillian Amber; and son, Jon, age 33, wife, Terri. I retired a few years ago, the senior practitioner in a busy three-doctor optometric practice down in the sleepy East Coast Florida village of Titusville. 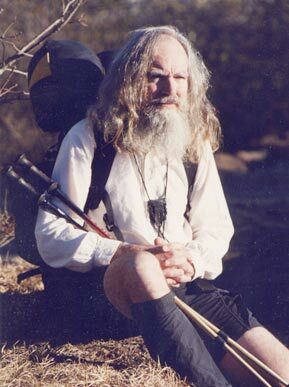 I started hiking and backpacking in the early eighties. During that time I managed to hike a good bit of the Florida Trail and about half of the Appalachian Trail, from Springer Mountain Georgia to Duncannon Pennsylvania, all in jerks and starts over a period of fifteen or so years. In January 1998, I set out on my first uninterrupted long distance hike. That trek began on the Florida Trail, thence continued to the Cliffs of Forillon, Cap Gaspé Quebec, a distance of over 4,000 miles. During that time I took on the trail name: Nimblewill Nomad. The years 2000 and 2001 brought about nearly that same hike in reverse, the first known trek o’er the entire Appalachian Mountain Range, at least as we know the majestic Appalachians to exist on the North American continent. That journey lasted 347 days, covered a distance of over 5,000 miles, and included a hike through the Long Range Mountains of Newfoundland. 2002 brought a cross-continental trek, an adventure-filled journey that lasted 147 days, over 3,000 miles, from the old lighthouse at Cape Hatteras North Carolina, to another old lighthouse at Point Loma in San Diego California. In 2003, in preparation for a trek up the Lewis and Clark Trail that runs from St. Louis Missouri to Fort Clatsop on the Pacific, a journey, God willing that I’ll attempt at age 66, I loosened my legs by hiking the Natchez Trace Trail, from Nashville Tennessee to Natchez Mississippi. Quite interestingly, these respective odysseys generated much insight, much joy, and much profound inspiration. As a result, in the winter of 1999-2000, I published my first book, Ten Million Steps. Shortly after came a book of poetry entitled, Ditties, and in 2004, my third book, Where Less the Path is Worn was published. Long gone, long ‘fore he’ll be back.